Facebook is taking over the world. With the move to more passive sharing, it’s becoming a bigger part of our lives. And now, for the first time, I think it spells trouble for Twitter. The litmus test: My wife. 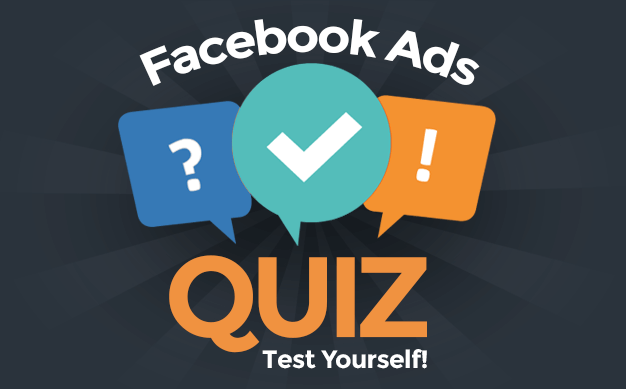 Are you subscribed to public updates on Facebook? My wife is a smart person. She doesn’t copy and paste Facebook status updates to keep her account free and avoid the “upcoming” subscription costs. She’s more technical than the typical person. Knows a little HTML. Is better at fixing computer problems than I am. But the only social network she uses is Facebook. And even though I got on Facebook in 2007 and raved of its benefits for reconnecting, she refused to get involved. She never got on MySpace, and she wasn’t going to waste her time with Facebook. Then, in the fall of 2008, her friends convinced her otherwise. And that is when I knew Facebook was going to be huge. If you can convince my wife that it’s worthwhile, it’s worthwhile. She did two things today that struck me: 1) subscribed to journalists on Facebook based on recommendations from the “dreamy” Pete Cashmore, and 2) asked me what Hootsuite was. 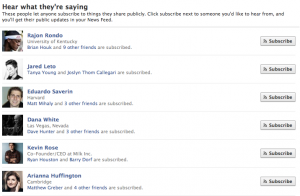 When Facebook rolled out subscriptions, I saw the value. I thought it would be cool to follow people there who wouldn’t be my “friend.” It’s a way of getting some of the information I would have been getting on Twitter now on Facebook. And it would also allow me to be more public by allowing people to subscribe to my public posts. But I wondered if it would be embraced by the mainstream. Twitter, after all, is still a niche service. It’s not understood by the masses. Would “subscribing” to public figures resonate? Or would it be another feature buried like the old Facebook Lists, which were used by fewer than 5% of users? My wife is subscribed to five people on Facebook: Ann Curry, Liz Heron, Anthony DeRosa, Pete Cashmore and Mark Zuckerberg. But it’s not just my wife. When I click on Facebook’s “Suggested Subscriptions,” I scroll through dozens of public figures to whom my friends are subscribed. Keep in mind, one of my biggest struggles with Twitter has been for personal use: Barring some exceptions, my close friends aren’t on it. If they are, most aren’t active. But those same friends are now starting to subscribe to public figures on Facebook. Now to my wife’s question: “What is Hootsuite?” I told her about it. I showed her Tweet Deck. But it means nothing to her. She is only on Facebook. She isn’t on Twitter. She doesn’t manage multiple accounts. All she needs to manage her streams of information is… Facebook. My wife wasn’t a first adopter of Facebook, but she led the rush. Twitter never appealed to her. In my mind, she is the perfect measure of whether something will be accepted in the mainstream. She is technical, but not nerdy. She’s a busy stay-at-home mom who doesn’t have time to waste. Her subscribing to public figures on Facebook tells me that it has utility and is easy to use. She is likely leading the rush once again. Suddenly, thousands — or millions — of Facebook users who couldn’t previously embrace Twitter are going to embrace the same type of interaction on Facebook. If this happens, doesn’t Twitter lose its grip? If more and more people are receiving their streaming news from public figures on Facebook, doesn’t that eliminate the casual users who utilize Twitter specifically for that purpose? Sure, Twitter will always have its niche user base who love the hash tagging and 140-character limit. And it will likely remain valuable for me, at least for some of my business accounts. What I do on @TweetsFrom1982 or @BrewCrewLive, for example, wouldn’t currently work on Facebook. 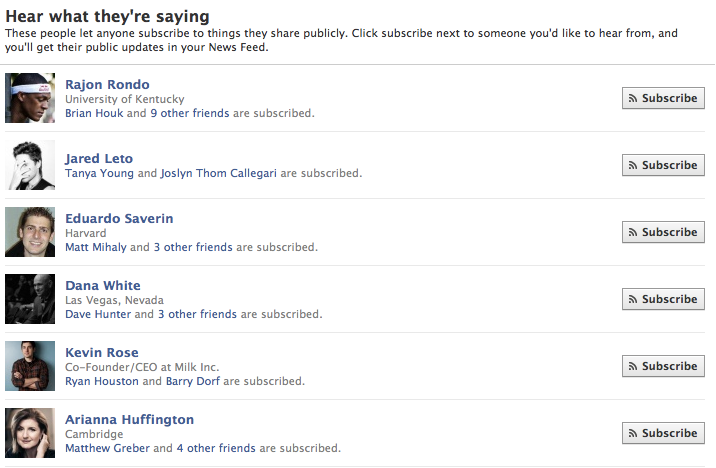 But something tells me that Facebook Subscriptions aren’t just another feature that will be used by the elite 5%. And combining that Twitter-like feature with a better control over spam and robot accounts… This spells trouble for Twitter. What do you think? Am I overreacting? Are the two completely unrelated? Can Twitter continue to grow and thrive even if Facebook Subscriptions become popular?